Like so many of you, I’m beginning to branch out to try other mesh heads. I have reviewed several over the last month, and of course, I wear LeLutka regularly. This time it’s Genesis Labs Chloe (2.0) available at The Fantasy Collective. Firstly I will say that while I don’t find Chloe all that “pretty,” I find her look really striking, which for me made wearing her more interesting. Secondly, this is a pricey head compared to the rest of the market. However it does include everything in one package, so you don’t have to mess around trying to find different appliers (as long as you wear the Maitreya Lara body), eyes, etc. It’s convenient but still, will take a chunk out of your $Ls until you realize what’s included. Specifically, the pack comes with 4 base tone skins, ears, mesh eyes, appliers in all four tones for Maitreya, Slink hands and feet, Lolas and Phatazz. There is also a shape included, which says “WEAR IT – for eyes.” But when I put it on, I no longer had my shape (I was shorter and more stout), so I quickly nixed that. Keep reading and see why this might have been a mistake. 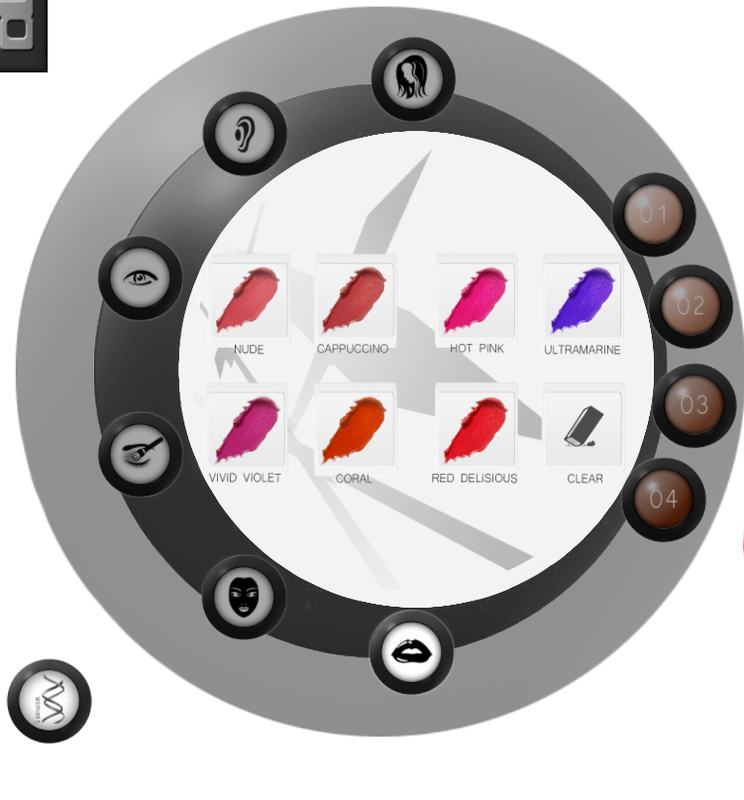 The HUD is excellent, with all four tones available and 7 eyebrow choices per tone, and then buttons for lip colors, complexion (freckles, moles, blushes), eye shadows and eyeliners, eye color, ear color and hairbase. The problem was that I could start with lips and complexion, and then try to change eye makeup and I would lose my lips (like below). In fact, the only time I was able to get the eye shadow color (there are four) to show up at all was by hitting the “clear” button on the complexion tab. I was able to get the eyeliner changes to show up consistently by selecting the head and then deselecting. So, perhaps that shape that says “WEAR IT” might have something to do with this all, lol. If so, that doesn’t work for me because I only want to wear my shape. The four tones are lovely and natural. And all the options throughout the HUD are blow me away fantastic, but as I mentioned, they didn’t work consistently for me. Other things I would want to see in future versions would be eye open/close options, some mouth open options, and eyelashes included. You will have to fit your own if you want to wear this head with lashes. TLDR: Genesis Labs does a masterful job including almost everything you will need to wear Chloe out of the box and go, but the features didn’t all work consistently for me. Other stuff: Yesterday Rowne had a flash sale where almost everything was 50% off. I owned most of the inventory already but I did pick up a several fatpacks of clutches for amazing prices, plus another color of the Alexia dress, which I am wearing here with shorts also from Rowne. I am also wearing FANTASTIC new shoes by ISON for the MIX event. For the first time, you can wear Harry’s shoes with your Maitreya feet!!! He is also having a sale today on select footwear with updates to Maitreya and Slink styles, so check that out. ← It’s that time again: Q2 Hair Purge! I have problem with the hud too! eyelines always for some reason disapheer and then it does not work to put it again, im tired from putting the head off and back again. Also i missing open mouth and eyes, plus its not easy to find nice eyelashes to suit 100%. Im little bit dissapointed and I think it is not worth paying too much.